Why Hawaii lawmakers often write incomplete bills and fill in key information later. Each bill must have an effective date so that we know when it starts doing what it is supposed to if it’s signed into law. Typically, income tax bills become effective for tax years beginning after a certain date. Excise tax bills usually become effective on July 1 to coincide with the start of the state’s fiscal year. “Defect the date” refers to setting the effective date very far in the future, such as July 1, 2050, so the bill would have no effect if enacted into law in that form. 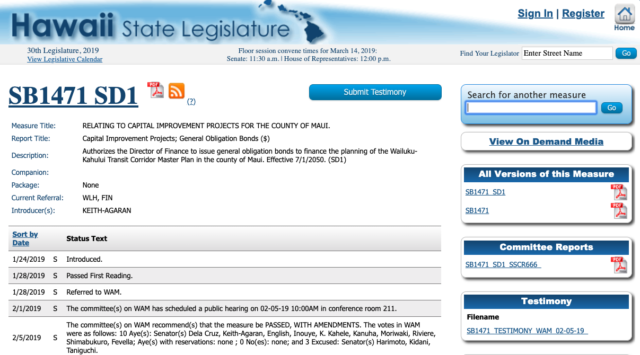 A screen shot of the status page for a Hawaii state Senate bill. “Blank the amount” is a similar technique that can be used whenever a bill has a number in it. The technique is often used on an appropriation bill that sets aside a certain amount of money to do what the bill proponents want. A similar clause is provided for operations of the University of Hawaii. Obviously, bills with blank amounts in them won’t have much of an effect if they are enacted in that form, even if they have an effective date that is not defective. The credit amounts were percentages of the capitalized costs but were left blank. The department then refused to allow any credit under these circumstances, as it explained in Department of Taxation Announcement No. 99-27. It is common for the defective dates to be fixed, and for the blank amounts to be filled in, when a bill pops out of conference committee. At that point, of course, the deal is done and there is no opportunity for public hearings or testimony. The public can still weigh in on the process by contacting individual legislators in hopes of swaying their votes on the floor, but for many of us that seems to be a waste of effort. Can the system be improved? We hope so!